Join the discussion on our forums! 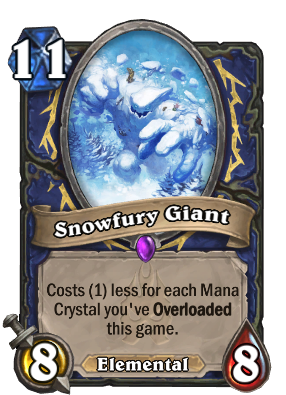 Come discuss Snowfury Giant over in our dedicated Snowfury Giant discussion topic. Evolved from 10 cost card. That kind of thing happens to me waaay too often. First 11 Mana minion, if you evolve deathwing, you get it. "I'd rather pay 4 mana for a 7/7 Flamewreathed Faceless rather than 11 mana for a 8/8 EleGiggle" Reynad August 2017 .
just play it with arcane giants too, a lot all of shaman's overload comes in the form of spells and it looks like there may be some new freeze spells coming that might overload. let's see i guess. I was messing around with an overload shaman in un'goro. finally have something worth building around. well the more likely candidate for that evolve in shaman is n'zoth, so that actually is pretty valuable. not only that, but having it be an elemental could be a big deal for future cards that use summoning instead of playing. you never know. When do you actually overload mana crystals? Current turn or next one? for example if you play an earth elemental do you reduce the mana cost of the giant immediately or do you have to wait till next turn? You overload the turn you play the overload card since when you play something like Lava Shock the locks come off the mana crystals the same turn. Nerf Yogg Saron, Hope's End When it cast Evolve, it'll be transform. well that might not necessarily be a bad thing considering how bad yogg's body is lol. but yeah, most of the time you get this early on, you're really sad.